We are very sad to report that Chez Albert has permanently closed. We’re on the chef’s mailing list and hopefully this absolute gem will be reborn in some other form. Now that we live just outside Amherst a new set of restaurants have become our “local” spots. One of them is Chez Albert. When we lived in Northampton Chez Albert was a place we went on special occasions. Now that it’s right down the road we’re there more often. We’d both love to go overboard each time we go and get cocktails, appetizers, salads, wine, entrees, desserts, coffee, and a night cap, but it’s just not a responsible use of our income. Luckily some summer menu changes have made Chez Albert as fit for a quick meal as it is for fine dining. We sit at the bar a lot since we’ve moved back to the area, because for a while there was a bar-only menu that includes one of the best burgers around. On our last visit though we were happy to see that for the summer at least the bar and main menus have merged, along with the addition of several small plates and sides. January 2016 UPDATE: We’ve been back several times since we posted this review and the menu has remained in its updated form. There are a few small plates, regular favorites, and several items rotating through. The burger is amazing and priced more reasonably than most bars in Chez Albert’s immediate vicinity. The daily specials are as adventurous as ever. We highly recommend trying the venison if it pops up again. We were seated on the patio and naturally, started with drinks. I had the “Bang Bang” with jalapeño-infused tequila, agave, lime, and cucumber and Molly had a brandy-based cocktail called the Chez 75. 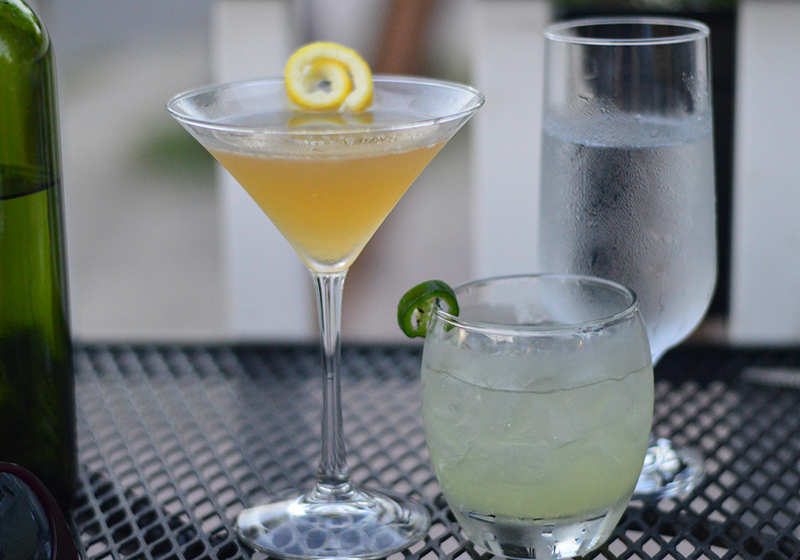 Neither were especially sweet, which was welcome, and both were perfect for a cool summer evening. 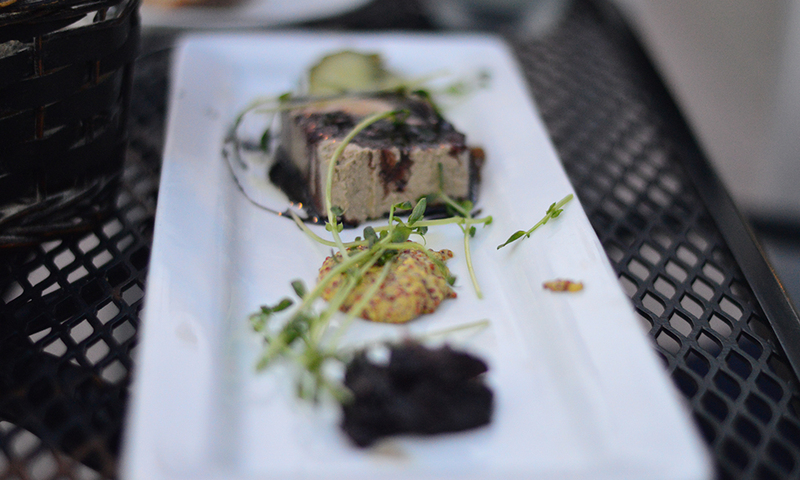 For appetizers I had the house-made pâté, which would have been satisfying enough with Iggy’s fresh bread, but was all the better with coarse dijon, caramelized onions, bread and butter-esque pickles, and reduced balsamic. 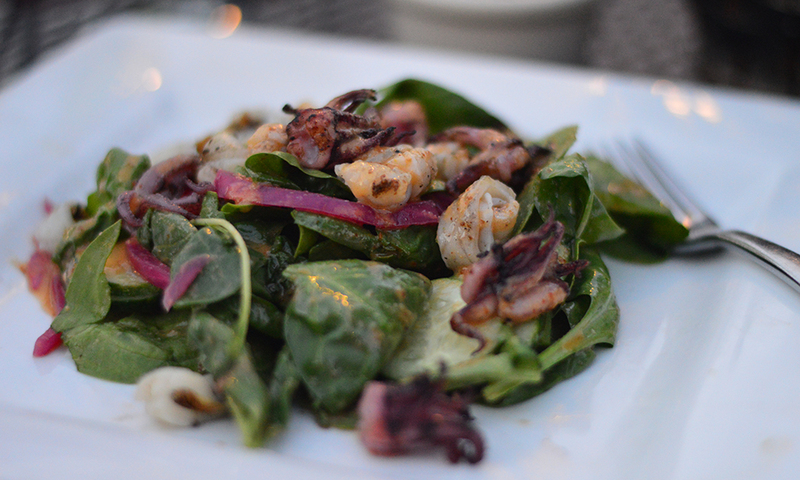 Molly had a grilled calamari salad with spinach and spicy ginger vinaigrette that we tried in vain to analyze in hopes of reproduction in our own kitchen. We’ll have to have it a few more times before we figure it out. For mains I had the duck from a new “Crispy Confit” section of the menu. 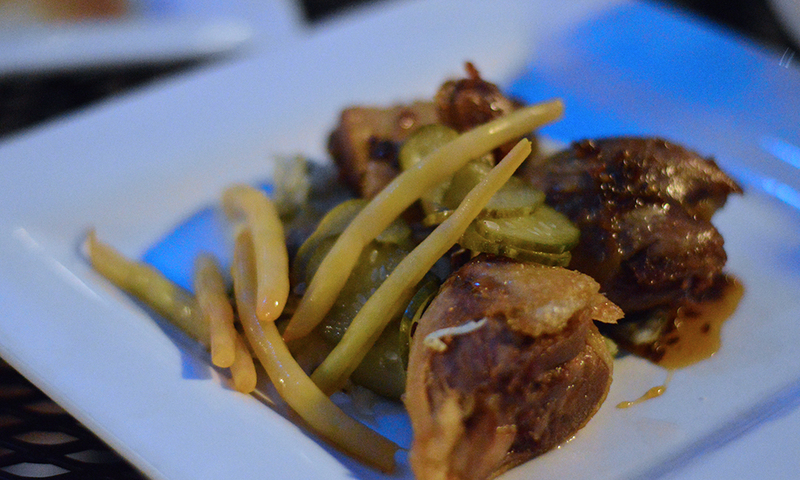 It includes oxtail, pork ribs, and chicken wings in addition to the duck and we hope it lasts beyond the summer. The duck was served on a bed of a distinctive slaw and accompanied with pickled beans and the same little bread and butter slivers from the pate. 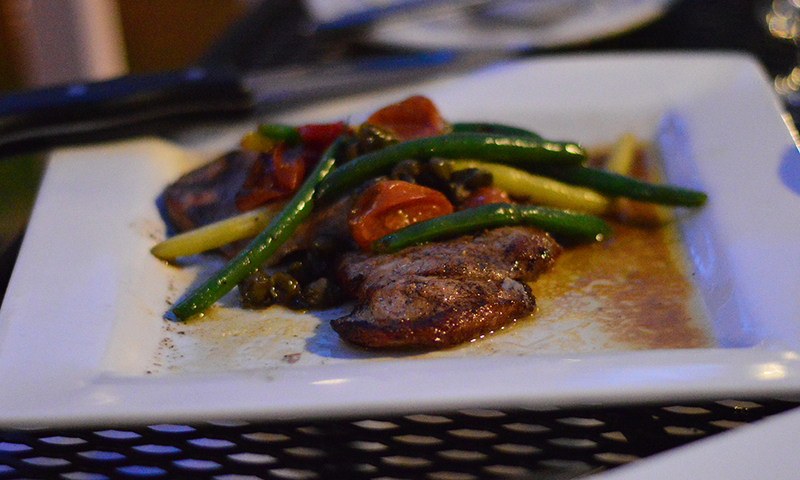 Molly had veal medallions with lemon, capers, local tomato, and string beans. We went our usual halfsies to try everything and were both happier with our own choices. I’m a sucker for confit anything, despite the fact many restaurants overcook the meat in a quest for crispiness. This was definitely not the case for my meal, and the leftovers even survived another heating without losing any flavor. 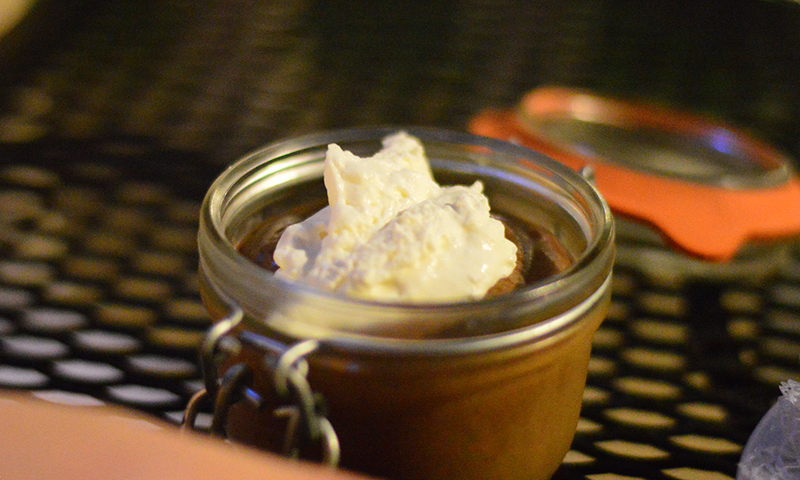 Finally we had a pair of desserts, creme brûlée and chocolate mousse. Perhaps a bit uninspired, but sometimes the classics, when executed perfectly, are best. 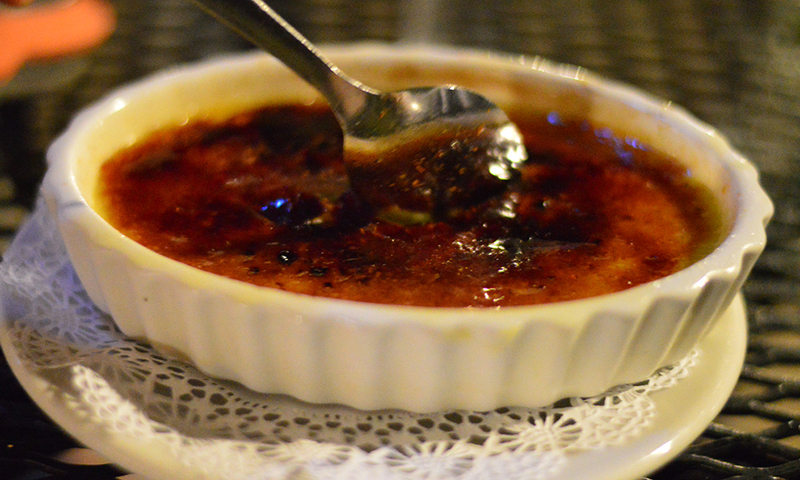 The creme brûlée was flawless, and although not advertised I could swear I got a tiny hint of saffron. There was a slight red tint, probably just the setting sun, so that’s probably what got it into my brain. If you haven’t been to Chez Albert in a while they’ve made a lot of changes to accommodate the more casual meal. I would though still recommend reservations. Unless of course you’d like to join us at the bar. Locally-sourced and always welcoming, Greenfield’s Hope and Olive feels like home.